St. Olaf College strives to help provide the necessary resources for each student to become prepared for life after college. Through Money Week and other financial literacy initiatives on campus, we seek to help students accomplish this goal. These programs seek to provide advice, guidance and real-world examples of financial decisions that students will encounter during their college years, as well as life after college. These efforts on campus are led by the Financial Literacy Committee. The Financial Literacy Committee coordinates and implements programming throughout the academic year for students in a variety of activities. This committee is made up of one Program Coordinator and three staff representatives. The Program Coordinator plans and coordinate with other student organizations to create the financial literacy programs on campus. The Program Coordinator(s) are chosen by the staff representatives based on an application and interview process. Although we are not experts in the field of personal finance, we are here to help in whatever way possible. 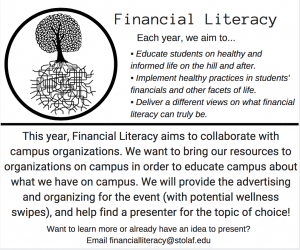 Please feel free to email a staff member at financial.literacy@stolaf.edu and we will do our best to answer your question or direct you to an appropriate resource.